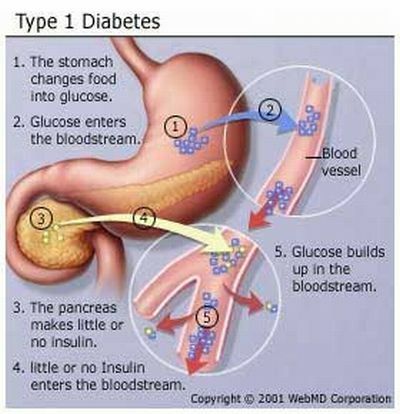 Type 1 diabetes develops due to malfuctioning of the immune system. Mounting scientific evidence indicates that vitamin D plays a vital role in the normal functioning of the immune system and vitamin D deficiency can lead to the malfunctioning of the immune system.Consequentenly,your own immune system starts to attack and kill your own insulin producing in the pancreas. Once you are unable to produce insulin, you develop type 1. Type 1 diabetes (T1D) is an autoimmune disease characterized by leukocyte infiltration into the pancreatic islets, and the treatment of adult with a vitamin D analog arrests the progression of insulitis, blocks Th1 cell infiltration into the pancreas, and markedly reduces T1D development, suggesting inhibition of chemokine production by islet cells. The vitamin D analog significantly down-regulates in vitro and in vivo proinflammatory chemokine production by islet cells, inhibiting T cell recruitment into the pancreatic islets and T1D development. 2. Vitamin D directly acts on the muscle and fat cells to improve insulin action by reducing insulin resistance. 3. Vitamin D reduces inflammation which is commonly present in patients with Insulin Resistance Syndrome and Type 2 diabetes. 4. Vitamin D indirectly improves insulin production and it’s action by improving the level of calcium inside the cells. Now you can understand the important role vitamin D plays in keeping blood glucose normal. Intuitively, vitamin D deficiency can lead to diabetes. Numerous scientific studies have found vitamin D to be low in patients with Type 2 diabetes. One such remarkable study looked at the level of vitamin D, prevalence of insulin resistance and risk for Type 2 diabetes in the U.S. population. In this study, researchers concluded that people with a low level of vitamin D were at high risk for the development of insulin resistance and Type 2 diabetes. -Evidence that vitamin D can prevent type 2 diabetes. In a study from Finland, researchers collected health data in men and women from the ages of 40 to 74. None of these individual had Type 2 diabetes at the start of the study. They followed these individuals for 22 years to see the pattern of development of Type 2 diabetes. These researchers found that people who had higher level of vitamin D were less likely to develop Type 2 diabetes. Thus vitamin D appears to have a protective effect against the development of Type 2 diabetes. In another study from the U.S., researchers found that vitamin D and calcium supplementation were able to reduce progression from pre-diabetes to diabetes. This protective effect of vitamin D was similar in magnitude to other measures which have been shown to reduce the progression from pre-diabetes to diabetes , such as a weight reducing diet, intense exercise and use of the drug, metformin. The vitamin D acts especially on proteinic component as "growing factors" type. Regulating t-cells and other protein components like laboratory tests have shown on mice. treatment of human autoimmune diabetes. The Vitamin D has important interactions with trascriptional regulators and cell signaling system, including androgen receptors,estrogen receptors, IGF, TGFbeta, beta-catenin and others , to control cell growth and differentation.